THE MOBILE AMUSEMENT INDUSTRY has been providing safe, family entertainment for more than a century and when it comes to amusement ride and attraction safety there is no higher priority. Ride owners, operators, attendants and manufacturers all realize that without adequate design, manufacturing, maintenance, inspection, training and safe operations the mobile ride industry would not exist. Manufacturers and ride owners, along with state regulatory agencies work together to ensure a safe and enjoyable visit for guests. Statistics published by the United States’ Consumer Product Safety Commission (CPSC) in September 2005 helps confirm the industry’s success in meeting this commitment. In the United States, we estimate some 500 million guests visit carnivals, fairs and festivals each year and the OABA believes that more than half of them participate on mobile amusement rides. The CPSC, which has jurisdiction over mobile rides, estimates in the September 2005 report that there were an estimated 2,500 non-occupational injuries treated in hospital emergency rooms, in 2004. This estimate is 500 fewer injuries than estimated in 2003 and the lowest it’s been since 1997. It should be noted that these estimates were obtained from the National Electronic Injury Surveillance System (NEISS). NEISS is based on a stratified statistical sample of about 100 national hospitals with emergency rooms, with a 95% confidence interval. A 95% confidence level in 2004, rounded to the nearest 100 injuries, translates to a range of 1,600 to 3,500 incidents. From 1987 through June 2005, there were eleven (11) non-occupational fatalities attributed to the mobile ride industry, over this eighteen-year (18) period. Knowing that most amusement ride guests enjoy several amusement rides on the midway, the number of mobile rides given annually could easily reach 300 million riders. Given this CPSC estimate, the Outdoor Amusement Business Association (OABA) estimates that in 2004 there were 8 ride-related injuries per one million riders. Also, the CPSC has reported in the past that only 0.8% of injuries are serious enough to require overnight hospitalization. In fact, amusement rides constitute one of the safest forms of recreation available to the public.Bicycling, ATV recreation, skiing, watercraft, snowmobiling and numerous other similar participatory recreational activities lead to numerous more injuries and many more fatalities every year than those stemming from mobile amusement rides. Moreover, analysis of state amusement ride agency reports and the CPSC has reported that some 60% of ride related injuries are due to guest/rider behavior, such as intentionally rocking cars, standing up, defeating safety restraints, sitting improperly, etc., rather than mechanical failure or caused by the ride operator. The remarkable record of the mobile amusement ride industry reflects the high priority placed on ride safety by state regulatory agencies, ride manufacturers and ride owners continuously improving the safety of rides. Through educational programs relating to maintenance, operations and personnel training, carnivals and independent ride owners are constantly engaged in promoting ride safety. In addition, almost all states have some form of mobile ride licensing, inspection and liability insurance requirements that ride owners must adhere to before the patrons can ride their rides. Ride owners must carry liability insurance as required by each state in which they operate and must pass rigorous “risk management” inspections by an independent, certified ride inspector, hired by their insurance carrier. 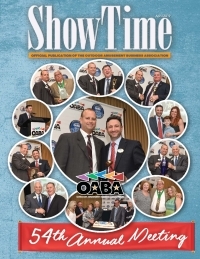 The OABA and some national showmen’s associations conduct safety seminars for management and ride operator-training programs. Several OABA board and general members participate in the development of amusement ride safety standards in conjunction with the American Society of Testing and Materials (ASTM). ASTM’s F-24 Committee standards cover design and manufacturing, testing, operation, maintenance, inspection and quality assurance, which further enhance the safety of amusement rides. In addition, many state regulatory agencies have adopted ASTM standards, which are reviewed periodically and updated by U.S. and international amusement ride and attraction industry members, along with state regulators. Ride safety is fundamental to the mobile ride industry. A genuine concern for guest safety and the recognition that a loss of public confidence, should an incident occur on rides could hamper attendance at fairs, festivals and other carnival events, make it a high priority to ensure amusement ride safety. To maintain this excellent and impressive safety record, carnival owners and manufacturers work closely together to improve ride safety technology, maintenance and testing programs. The carnival industry endorses and its members participate in individual safety certification programs with the Amusement Industry Manufacturers and Suppliers (AIMS) and the National Association of Amusement Ride Safety Officials (NAARSO). This unwavering commitment to safety has allowed the carnival industry to thrive for more than a century, and will ensure that it continues to provide safe, quality, family entertainment for many years to come. The Outdoor Amusement Business Association, headquartered just outside of Orlando, Florida, represents thousands of members in the United States and Canada, who are involved in carnivals, circuses, independent ride operations, food and game concessions, amusement rentals, as well as manufactures and suppliers related to the mobile amusement industry. For over 45 years this non-profit, trade association has promoted, protected and helped preserve the tradition of family enterprise in the carnival industry, through education, legislation, communications and member services.